Do you have what it takes to be a highway warrior? Score a copy of this gem on eBay, you won’t be sorry. And this way, no one gets hurt. Four and a half rocket launchers out of five. 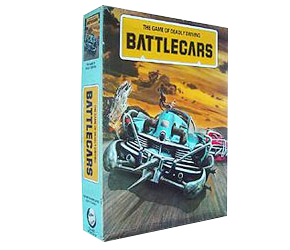 I like this game so much I remade it at Matchbox car scale (though I later decided to use 6mm scale cars and bikes from Irregular Miniatures). The new templates have been completely redrawn for a modern look—laminate them and use a whiteboard marker to mark damage—and the playsheets combine the car/bike sheets with their appropriate driver sheet plus modifications specific to that car/bike. Also includes graphics and instructions for making your own ‘speedometers’. The templates are in colour-coded and ‘classic blue’ versions as well. it did it again! BATTLECARS and SESH – pigging autocorrect! You got their in the end! 🙂 Glad you found the EOG – don’t forget to sign up to the newsletter! You’re very welcome.